Goin' faster than a roller coaster. Charles Hardin Holley (7 September 1936 – 3 February 1959), better known as Buddy Holly, was an American singer, songwriter, and a pioneer of rock and roll. Although his success lasted only a year and a half before his death in an airplane crash, Holly inspired and influenced many contemporary and later musicians. Maybe baby you'll be true. All songs written by Buddy Holly, except as noted. It's so easy to fall in love — it's so easy to fall in love. So here I go breaking all of the rules. Maybe baby you will love me someday (someday). And we'll know why just you and I know true love ways. You recall a girl that's been in nearly every song? This is what I heard of course the story could be wrong. Now she's wearing a band of gold. Crying, waiting, hoping, that you'll come back. I just can't seem to get you off my mind. You're the one I love and I think about you all the time. A-well, you know my love a-not fade away. That'll be the day — when you say goodbye. Without Peggy — my Peggy Sue. Oh well, I love you gal — yes, I love you Peggy Sue. Peggy Sue, Peggy Sue — oh how my heart yearns for you. Oh Peggy — my Peggy Sue. A hey — a hey hey. I just want to say that one time when I was about sixteen or seventeen years old, I went to see Buddy Holly play … at a Duluth National Guard Armory and I was three feet away from him. … And he LOOKED at me. And I just have some kind of feeling that he was — I don't know how or why — but I know he was with us all the time when we were making this record in some kind of way. 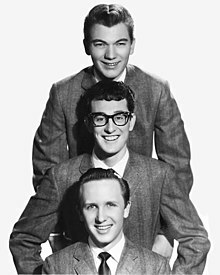 Conspiracy theorists might have it otherwise, but any mystery relating to Buddy Holly's death has nothing to do with the plane crash. Far more intriguing is why the six marvellous songs he wrote shortly before he was killed should be among the most angst–ridden in the entire canon of rock. … Whatever the reason, Holly's last compositions were a wonderful achievement. Heard as he recorded them, without the overdubs, his voice is crystal clear yet raw with emotion. Close your eyes and, 50 years later, Buddy Holly is singing directly to you from across the room. Ian Whitcomb, in Show 27 - The British Are Coming! The British Art Coming! : The U.S.A. is invaded by a wave of long-haired English rockers. [Part 1] : UNT Digital Library. Pop Chronicles. Digital.library.unt.edu (1969). Retrieved on 2011-01-15. This page was last edited on 26 December 2018, at 03:22.